The Voices of the Past is a series of audio dramas that characterize the rich and plentiful history of a small northern Michigan community - Beaver Island, MI. 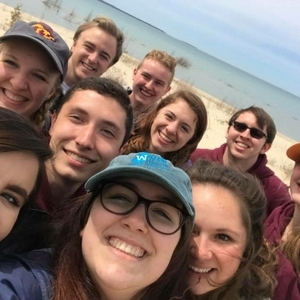 These stories are based on true and factual research conducted by Central Michigan University Honors students during a 2018 Summer class on the Island. All nine students (and professor) came together in one effort to produce this piece of work. Thank you for listening. If you liked what you heard, contact Professor Will Andersen with any questions, concerns, or comments: ander1ww@cmich.edu. Thank you to the entire Beaver Island community for allowing us to tell your stories and become a part of the local life. We can't tell you how much it means to us. Our final drama entails the life of Feodar Protar. He was a selfless man who near the end of his life, moved to Beaver Island after selling his riches and became a local legend. Writer: Emily Schwemer Actors: Anna Rudnitsky, Sam Anker, Zain Olson, Grant Polmanteer, Keygan Galloner, Evan Miller, Abbey VanAllsburg, John Slough, Emily Schwemer, Jordyn Rademacher Editor: Grant Polmanteer This piece of work was a collaboration between all students that were a part of the 2018 Beaver Island radio drama class. In our third drama, we characterize the idea of "wearing many hats", as many citizens do on Beaver Island. Writer: Sam Anker Actors: Keygan Galloner, Evan Miller, Editors: Grant Polmanteer, Zain Olson, Sam Anker This piece of work was a collaboration between all students that were a part of the 2018 Beaver Island radio drama class. In our second piece, we follow a day in the life of fishermen off the coast of Beaver Island facing strict fishing laws. Writer: Zain Olson Actors: John Slough, Zain Olson, Abbey VanAllsburg Editors: Grant Polmanteer, Zain Olson This piece of work was a collaboration between all students that were a part of the 2018 Beaver Island radio drama class. In our first radio drama, we tell the tale of two Irish families who initiate their adventures to Beaver Island in an Irish pub. Writer: John Slough Actors: John Slough, Grant Polmanteer, Emily Schwemer Editor: Grant Polmanteer This piece of work was a collaboration between all students that were a part of the 2018 Beaver Island radio drama class. An introduction to the world of Beaver Island and the stories captured within our series of radio dramas.